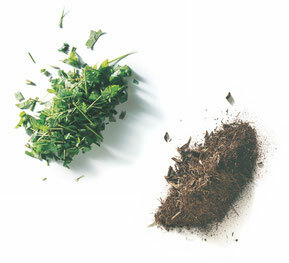 The ECOREFINE technology is a procedure for purifying soil contaminated by pollutants or other materials (e.g. mill scale sludge) in "on-site operation”. This purpose-built system can be operated both mobile and stationary. The new procedure is founded on vacuum evaporation and allow time-saving and quick decontamination without using any additives. Through inlet sluices the contaminated material is continuously brought into an evacuated container and heated up during passage. The moist parts (water and several carbohydrate compounds) evaporate during this process. These fumes get sucked off the container, are separated from dragged dust particles and then condensed. The purified material leaves the container through outlet sluices. Most of the solid and liquid final products gained that way can be recycled. Soil can be reused for agricultural purposes after being mixed with water and bacteria. 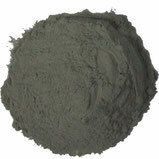 Metallic powder gained from grinding sludge can be added to blast-furnace processing; most of the separated carbohydrates (oils) can be reprocessed.This procedure has already been realized as a pilot plant which has also been tested numerously to confirm the functionalism. Steady TÜV Thueringen (a branch of the German Technical Control Association) and other institutions' analyses ascertained that this procedure gives maximum purifying results. This mobile system operates extremely effectively and is able to purify up to 17,000 kg of contaminated material per hour. The closed system guarantees a clean and low-noise operation. The procedure causes only very few pollutants far below the official restrictions. The low procedure temperatures keep a high percentage of the mineral and biological properties of the soil. In contrast to that the recent thermal procedures burn and destroy the soil at about 1,400°C. The TÜV Thueringen repeatedly certifies the functionalism of the ECOREFINE and says: "The results corroborate the principal applicability of the procedure for the decontamination of the soil samples in hand. A purifying rate of up to 99.3% was ascertained.” Additional advantages of the ECOREFINE are its mobility and therefore its various application possibilities, as can be proved. The purifying on-site process avoids long distance transports of contaminated material. The ECOREFINE will take up an important position in the existing market both technologically and economically. The ECOREFINE is able to vaporise substances* from contaminated material. 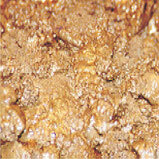 Mineral hydrocarbons (MHC), e. g. crude oil, heating oil, diesel, petrol etc. * The substance to be separated from the material has to reach a vapour pressure of at least 1 millibar at a maximum temperature of 300°C. Purification of contaminated industrial materials. "to understand a new technology, you have to understand its process. It is not enough to copy a machine." The ECOREFINE is suitable for the treatment of contaminated industrial material like grinding sludge, mill scale sludge (see opposite illustration), sludge from oil production and oil processing as well as contaminated rubble from construction sites. 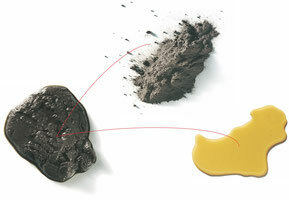 The purifying of mill scale sludge of the company PREUSSAG showed excellent results. 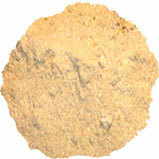 Mill scale sludge is an oil-contaminated waste product from steel working processes. After separating oil and water the dry substance can immediately be reused as raw material for sintering processes through which considerable economical advantages arise. For these terms of reference other renowned companies are also interested very much in the ECOREFINE. There is an option for further application possibilities of the ECOREFINE for the Blue Building Foundation (FZE) worldwide. 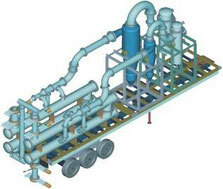 At the moment the purification of oil sludge in the World is an investigated field. That includes for instance drilling mud of the oil production and tanker sludge. 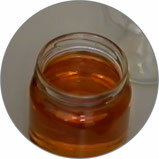 The separated oil can be reused in both applications. 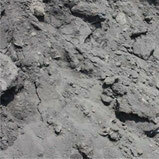 There is a large number of procedures being applied to purify polluted soil and other contaminated materials. The most important methods being applied are the physical-chemical procedures (soil washing), the thermal procedures (combustion) and the biological procedures. In case of damage the question of costs is decisive besides the basic suitability. The following table shows the prices per ton for the purification of soil with the above-mentioned procedures compared to the ECOREFINE. Costs for excavation, transport, storage and disposal of residual substances are not taken into account. The price differences in each individual procedure are essentially a result of the material structure, the pollutant spectrum or the pollutant concentration and the quantity of the material that has to be treated. The preceding table shows that the ECOREFINE has a significant price advantage compared to other procedures. Furthermore, in comparison with the ECOREFINE e. g. soil washing procedures leave considerable and expensive shares of residual substances. The biological treatment appears to be the more profitable one, but the applicability depends on requirements like degradability and micro-organism growth conditions. That is why this method is doubtful. The thermal procedure has certainly a large range of application but compared to the ECOREFINE it requires approximately the triple power supply. Additionally the great expenditure for the purification of the flue gas causes far higher costs. In comparison with that it has to be stated that the mobility of the ECOREFINE allows a quick and reliable response to urgent cases of contamination (oil accidents - leaking of fuel). All data mentioned in the following give the criteria for the assessment of the real sales opportunities of the ECOREFINE in the field of the rehabilitation of past settings (soil decontamination). Due to its mobility, the ECOREFINE is able to carry out rehabilitation measures on site (on-site procedure) at a reasonable price. As a result costs for transportation to stationary treatment plants (off-site procedure) do not arise. Vacuum technique is the principle of the ECOREFINE. "The realization of engineering measures which ensure that in connection with its existing or intended using an abandoned waste dump does not put peoples' lives and health or other goods that have to be protected at risk. These measures are supposed to guarantee that after rehabilitation the contaminated soil does not endanger the surroundings and, if at all, only minor known impairments may com up which can be kept under control. For rehabilitation measures securing and decontamination techniques or procedures are available. In a broader sense also unavoidable shifts can be related to the rehabilitation.” (compare the contaminated soil elements of the Ministerium für Umwelt, Raumordnung und Landschaft des Landes Nordrhein-Westfalen which is the North-Rhine-Westphalian Department for Environment and Regional Planning). Due to scarce financial funds of the municipal customers and private investors a detailed cost-benefit analysis has to be carried out before a rehabilitation measure so that rehabilitation show a justifiable financial expenditure. The determination of the expected costs for the decision making for both the carrying-out of a rehabilitation measure and the selection of the appropriate rehabilitation procedures is difficult in most of the cases. The cost comparison is getting more difficult especially by the differences in rehabilitation techniques, procedures as well as prices which are supplier specific. Even offer prices for similar procedures for one and the same case are to some extent only difficult to compare, as it is often unclear which additional services are included in the treatment price. To obtain understandable cost estimates it is necessary to define the partial performances which are required for the rehabilitation, the calculation of the respective costs depends on influence factors. Location specific factors are, among other things, the total contaminated soil area, the contaminated area share, immediate steps, the vertical extension, the contained pollutants, the pollutant concentration, the mobility of the pollutants, the geological and hydro geological situation, legal problems as well as jurisdictions have to be quoted. That is why it has to be the aim of the orientation, detail and rehabilitation investigation to quantify the influence factors as exact as possible. Among other things these factors include the legal situation concerning the license, official stipulations, the availability of stationary treatment plants as well as semi-mobile plants, transportation distances, disposal shortages etc. A short rehabilitation period has an effect on the choice and on the costs of the rehabilitation technique as well as on the financial situation of the customer. After choosing the appropriate rehabilitation procedure also the market situation and the operating rate of the rehabilitation companies as well as plant technical and operational parameters can influence the costs. Unforeseeable down times mean additional costs. Using thermal processing, especially organic pollutants in the soil are dispelled into the gaseous phase by energy input. The elimination of pollutants takes place in a pyrolytical reaction, combustion or evaporation of pollutants depending on the applied procedure. During these processes it is likely to have irreversible changes of the soil composition, for instance by dehydrating of clay-bound minerals, sintering or melting. A primary treatment of the soil by sorting (riddling and metal deposition) and crushing as well as a waste air purification by exhaust reheat and flue gas purification following the actual treatment are required. The combustion takes place at 1,100°C - 1,400°C (high-temperature procedure) and excess of oxygen, while pyrolysis pollutants are dispelled at 550°C - 650°C without oxygen. temperature and therefore the related energy costs of the plant. The microbiological treatment is especially used for mineral oil contaminated soil. The degradation of BTX (benzene, toluene, xylene), LCHC (chlorinated hydrocarbons), alicyclic chlorinated hydrocarbons and PAH (polycyclic aromatic hydrocarbons) is principally possible but requires more time. The addition of structure material to fine soil is necessary. The level of pollutant concentration determines the time expenditure and the related costs for the microbiological degradation in order to reach the destined target of rehabilitation. 1. The pollutants in the soil have to be degradable by microbes. 2. The pollutants must be bio available. 3. The geological-hydro geological characteristics of the soil or the subsoil and the physical-chemical characteristics of the soil allow bio availability i.e. standardization of their required physical-chemical (environment) and process engineering (material transportation) conditions for the micro biological degradation of the pollutants. 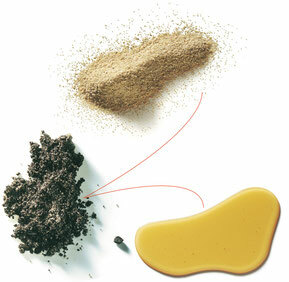 This technique is suitable for soil which is contaminated by mineral oil hydrocarbons. The suitability of the soil wash technique is depending on whether the pollutants of the contaminated soil structure can be dissolved or dis-persed. 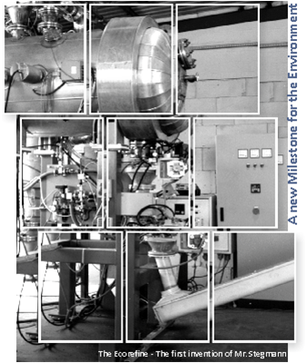 due to varying distances, quantity and material consistence. will increase. If there should be any volatile pollutants expenses for waste air purification have to be considered. The costs of the physical-chemical procedure depend on both the pollutants' composition and specific properties of the contaminated material. If the addition of any solvents should be necessary also the costs of water treatment will increase. If there should be any volatile pollutants expenses for waste air purification have to be considered. Under vacuum conditions (103- 50mbar absolute) the contaminated material is heated up to 50 to 300°C; the pollutants are evaporated and thus separated from the solid material. By means of an especially designed cyclone separator dust particles of the sucked gas stream are deposited; afterwards the pollutants get changed again into their liquid state by passing various condensers. At the end of the procedure the decontaminated solid material and the distilled pollutants leave the ECOREFINE separately. Usually separated hydrocarbons can be recycled. Purified soil can be used again e.g. for agricultural purposes after having been enriched with moisture and dry bacteria. Regarding the parameter hydrocarbon (crude oil) a purifying capacity of approximately 97% was figured out. When using vacuum distillation it is possible to remove frequently occurring contaminants such as alphatic hydrocarbons, aromatics and halogenated hydrocarbons etc. The removal of mercury by the vacuum procedure is possible as well. Other heavy metals can only be separated if they are available as volatile compounds (boiling point at normal pressure approximately < 450°C) for instance leaded tetra-methyl. The extraction or separation of heavy metals is a very relevant fact in assessing the different rehabilitating procedures. Here biological procedures are not suitable and chemical ones are only applicable under certain conditions. The soil washing procedure is suitable for heavy metal removal only with limitations. Due to the vacuum conditions most of the contaminants can be treated at relatively low temperatures (max. 100°C); the purified soil preserves its mineral properties and the biological ones as far as possible contradicting the high temperature thermal procedures (up to 1,400°C). The cost calculation for the ECOREFINE is based on a price of € 50.00/ton quantity of treated soil, stating € 23,98 as costs for the core performance. Compared to the three competitors' procedures the ECOREFINE has a substantial market advantage due to its essentially lower running expense. However, the add-on costs in terms of soil type, pollution and pollutant concentration remain to be analyzed. Which impact do these variable parameters have on the additional costs? For a realistic cost-benefit calculation the general cost impact factors always have to be considered. A major problem in the future will be dangerous waste. Accumulated over the years, increasing volumes of infectious waste produced by health care, rubbish, sewage sludge, and the rapid increase of the world population needs to be taken care of. Diseases like SARS, bird flu, BSE and natural disasters confront the waste disposal industry with ever more complex tasks. The most sensible treatment of biologically contaminated materials consists in converting them into household refuse or recycling in a manner that ensures elimination of bacteria. Contaminated Soil .... and so much more. Through sterilization of the contaminated waste, pollution is being eliminated. Up to 99% of all waste can be recycled that way and help to secure a healthy environment or our future. The ECOREFINE system has been proven a successful solution to this increasing waste problem and can eliminate a broad spectrum of contaminated materials worldwide. Depending on the nature of the contaminated material, the ECOREFINE is also able to generate a profit by creating pure end results that can be re-sold or re-used in today's markets.